Village leader Rafael (Joel Torre) finds himself in a real bind when American soldiers set up a garrison in his baryo. Lieutenant Compton (Garrett Dilahunt) believes part of his job is to win hearts and minds, but Colonel Hardacre (Chris Cooper) is only interested in getting intel about the enemy. If the carrot works, fine, but Hardacre has no aversion to using the stick if necessary. Although Rafael is somewhat ambivalent about the rebels himself, his son Joaquinito (James Obenza) has run off to join their ranks, and his brother Simon (Ronnie Lazaro) heads the local cell. Family ties offer no guarantee that Rafael won't be killed if he's perceived to be helping the foreign occupiers, though. As Rafael says to his wife (Rio Locsin), he's, getting “f---ed from both ends.” He knows that whatever he does, his fate is sealed. The best he can do is try to take care of the villagers in his charge so that when this war eventually ends, they won't be too bad off. 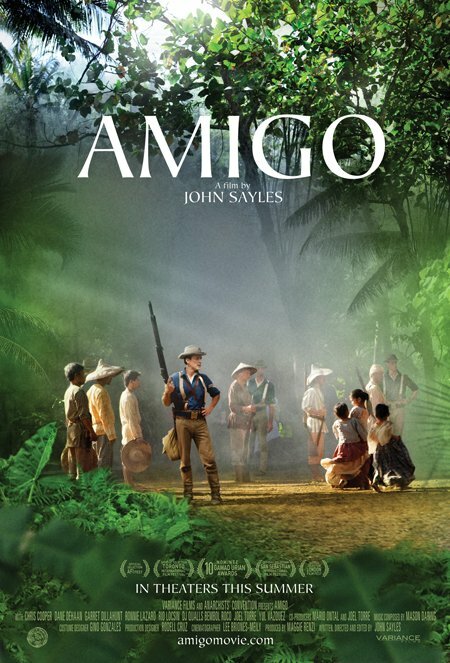 AMIGO is set in the year 1900 during the Philippine-American War, but the parallels to other conflicts are unmistakeable. The problems facing regular folks just trying to survive while caught between various warring factions are pretty much the same today in Afghanistan and Iraq as they were 100 years ago in the Philippines. So are the problems facing the occupying forces, chief among them the language barrier and a poor understanding of the native culture. Writer/director John Sayles got his start writing screenplays for Roger Corman's New World Pictures, and while it might seem odd to compare a classy historical drama like this to drive-in fodder like PIRANHA or ALLIGATOR, AMIGO actually follows the Corman formula fairly close. Corman always insisted that his films have some kind of social commentary to them, but the message had to take a back seat to making an entertaining film. And that's exactly what Sayles does here, pulling us in with a good story and strong characters. He integrates his socio-political themes well, only occasionally coming across as obvious or heavy handed as in a scene where a character is tortured by waterboarding. The main story here is Rafael's; he's a great character to spend a film with, and Torre's performance is excellent. That said, the film is a true ensemble piece with most of the supporting players getting at least a scene or two in the spotlight. That does make for a meandering film at times, but for the most part I enjoyed the roundabout way AMIGO gets to its destination. 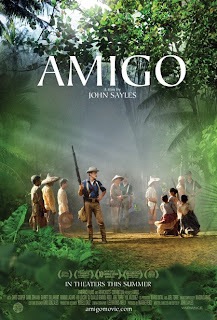 And if AMIGO doesn't quite measure up to the best of Sayles' work like LONE STAR or RETURN OF THE SECAUCUS SEVEN, it's still better than 90% of the American films I've seen this year. 3 1/2 out of 4 stars.